A previously overlooked predator—a thumbnail-sized snail—could be increasing the pressure on coral reefs already weakened by the effects of overfishing, rising ocean temperatures, pollution, and other threats, researchers say. The snail damages coral by sucking fluid from coral like a tick, and may have been ignored because it camouflages itself on reefs and doesn’t move around to leave obvious signs of its attack. 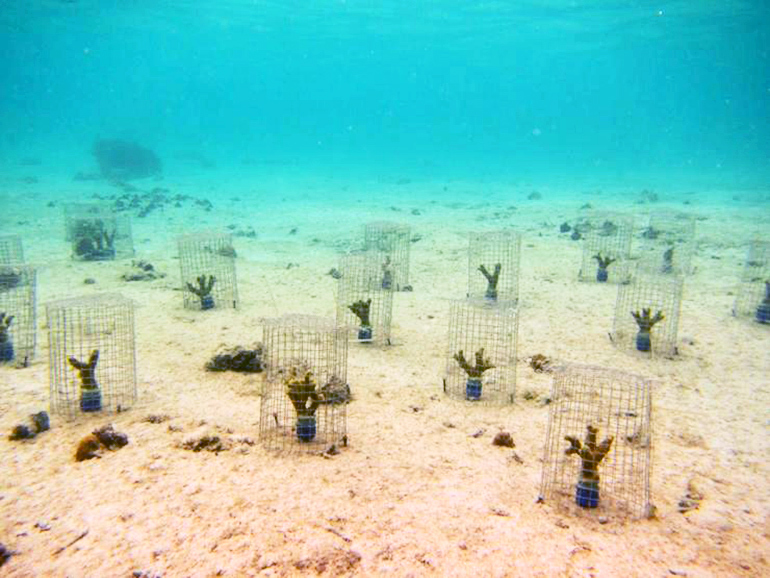 In experiments done directly on Fiji Island reefs, scientists quantified the impact of the snails, and found that attacks could reduce the growth of Porites cylindrica coral by as much as 43 percent in less than a month. “Once the reefs are down and nearly out, these snails are piling on,” says Mark Hay, a professor in the School of Biological Sciences at Georgia Tech. As reported in Ecological Applications, in areas protected from fishing, postdoctoral fellow Cody Clements never found more than five of the creatures—whose scientific name is Coralliophila violacea—on a single coral colony. But on degraded reefs where fishing is permitted, he found hundreds of the snails on some declining coral colonies, as much as 35 times more than colonies in the protected areas. To assess the damage, he devised an experiment to measure how the snails affected coral growth. On the reefs near Votoa Village on Fiji’s Coral Coast, Clements isolated coral branches and attached snails to them. After a period of 24 days, he compared the growth of snail-infested coral branches to comparable branches that had no snails. During that three-week period, the predators reduced coral growth by approximately 18 to 43 percent, depending on snail size. 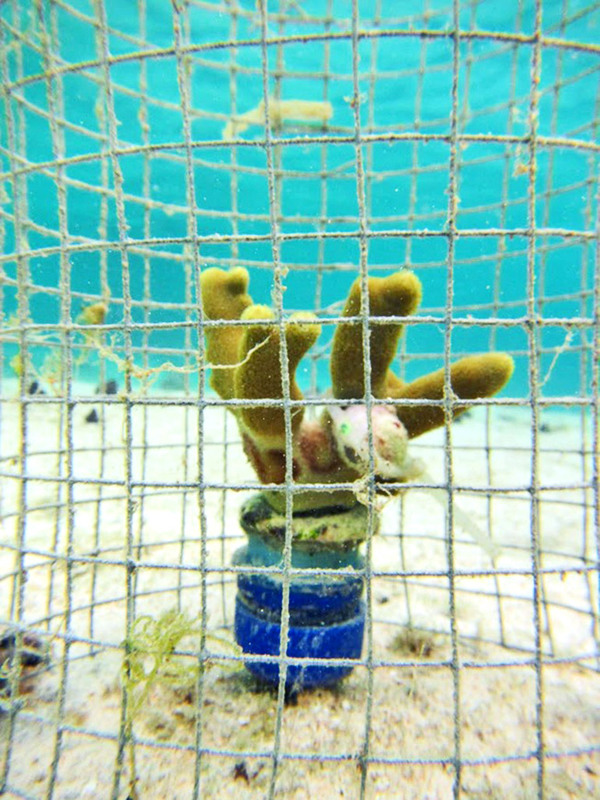 In coral ecosystems, fish help keep many predators and seaweeds under control. For that reason, fishing is forbidden in marine protected areas to maintain species diversity. To confirm their suspicions that overfishing was related to the snail problem, Clements tethered individual snails to reefs in a paired protected and unprotected areas. When they returned to examine the experiment, they found that snails in the protected areas had been eaten, and evidence left behind suggested they had been consumed by triggerfish and other species with teeth able to crack the snail shells. Predation of the snails was 220 percent higher in the marine protected areas compared to unprotected areas with few remaining fish, they found. The snail shells are covered with marine growth, so they’re difficult to see—unless you know what to look for, Clements says. During the research, Clements removed more than 2,000 of the snails with needle-nosed pliers. The Porites coral often provides the foundation for reefs, and is considered one of the most hardy species because it is less susceptible to disease, less attractive to crown-of-thorns sea stars, and more resistant to damage from seaweeds. For that reason, researchers believe it may provide a way for reefs to recover if conditions improve. Unfortunately, that coral is also a favorite for the small snail. The findings reinforce a lesson Hay and Clements have been working to explain for years. The National Science Foundation, the National Institutes of Health, and the Teasley Endowment to the Georgia Institute of Technology funded the work.